Here we are, day 5 of the 5 day installment! I hope they have been helpful and if not I hope you have at least enjoyed a festive post or 5 on my blog. The last one is beauty. Now some might say, but why, you aren't into beauty. Well actually I enjoy it a lot. I like how it can make you look and feel when you practically paint your face and also I love skincare, it is a weakness of mine and I follow a routine day and night because I just really enjoy and same goes for fragrances I do not leave the house with spritzing myself. So there is something for anyone, even if you aren't a big make up lover. Ok so a lot of girls enjoy make up, so why not try and route around your gals make up bag and see if they're running low, make a note and surprise them with topping up their stash, you don't know how appreciated they could be. Alternatively, there are also many brands that can be a little expensive but lust worthy, why not treat them to a new product they have never tried before (obviously make sure it's something they want before you go spending a small fortune) But they would be a wonderful idea. I love charlotte tilbury prodcuts not to mention very photogenic products, nars are always pretty good. Skincare is another great idea, there are many many many options and most girls claim they need them all, me included, they do different things after all! I went through a face where I think I bought like 3 different moisturisers in one go because they were all for different purposes, well that's what I told myself. I am forever restocking my skincare so like the make up why not see what someone is running low on and help them out. Also some skincare could be a lustful product so you could surprise them with that and also around this time of year there are plenty of skincare/haircare sets to pick from! Good places to look are the botanics range at boots, kiehls, clinique, glossier (they have make up to) origins do good gift sets too. 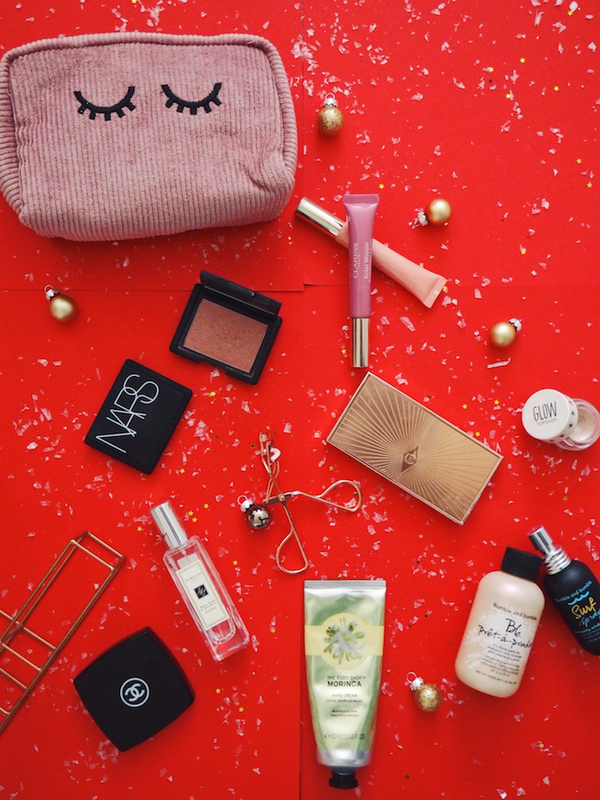 You can't write a beauty gift guide and not mention perfume. Like mentioned in the gift guide for her post. It really is probably one of the most perfect gifts, But like mentioned, make sure you know her taste in perfume they all smell very different and all have different prices ranges, favs of mine at the moment are Jo Malone, Byredo, Elizabeth and James, tom ford, YSL black opium and even & other stories fragrances are pretty dreamy! Can you believe 5 posts done already, this was so fun to do! I kinda wish I'd done blogmas now, but hey always next year! Also happy first of December, only 24 days until the big day now!! Happy shopping and I hope these helped even just a little bit! That beauty bag is so cute! !